18" diameter Portable Base which has the five rib design and hold fast clamp that eliminates the use of set screws. 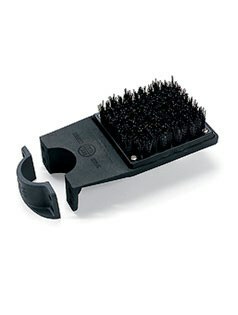 Made of durable, lightweight cast aluminum. Spike included for extra stability. Color of the base will match the Ball Washer color unless otherwise directed by you. 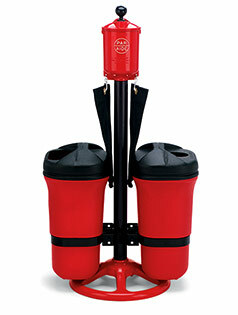 This Master Ensemble is available in 9 different Ball Washer & Portable Base colors. Unit can be completely flushed and cleaned by removing only two marine coated, stainless steel set screws. Tamper-resistant drain plug with gasket eliminates any chance of leaking. 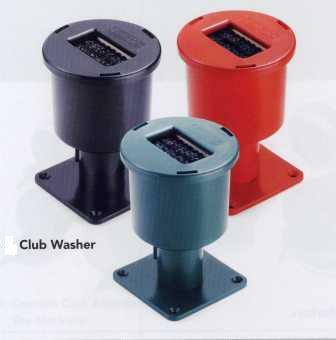 Aluminum castings allow for unlimited color options and unmatched durability. Great for Nylon & Polypropylene Synthetic Putting Greens. Constructed in the USA with 99 precent American made parts. From Don G. of Glastonbury, Connecticut on 5/6/2008 .